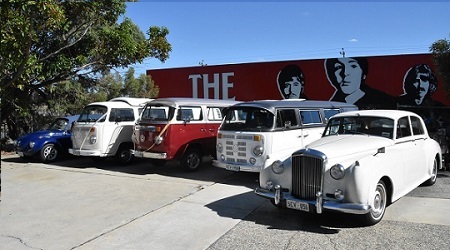 The iconic stature of the classic VW makes it perfect for promotions. The classic VW design and its offshoots are all incredibly photogenic. The look is distinct and brings back positive memories for many. In fact, their ability to draw a crowd makes the split window Kombi an excellent “guest” for promotions. One of the many ways that our split window Kombi fleet gets used is to show up at events to help with promotional activities. Brand promotions are something we handle, and there’s no problem with putting advertising displays on one of our models. The classic VW is probably one of the least camera-shy cars ever made, and there’s something about it that draws in crowds. This property makes them great as accessories to an on-site advertising or promotional campaign. Whether you need a split window Kombi for promoting a new brand or as background for a photo shoot, we are ready to provide. Our fleet also does work on the sets of television shows, films, and more. While not everything that gets put on film is going to need one of our vehicles, you never know when that extra touch might come in handy. Period pieces in the right era love our cars too. No matter what your promotional needs are if you want a split window Kombi or a stretch model, we are ready to provide. We have an impressive fleet so you can take your pick of what works best for you and your event. In fact, if you need more than one, we can handle those too.